Medium: original etching. 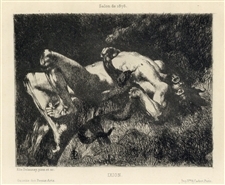 Printed on laid paper by Cadart and published in Paris by Gazette des Beaux Arts in 1876. Plate size: 5 1/8 x 6 3/8 inches (130 x 165 mm). Not signed.